Toothbrush sanitizers help to keep you and your family healthy by using germacidal ultraviolet (UV) light to kill bacteria. These are the same sorts of lights that hospitals use for disinfection. It is important to disinfect your toothbrush or other oral appliances, especially after you've had a throat or a sinus infection. It is possible to re-infect yourself with your toothbrush after a throat infection if you're not careful!. 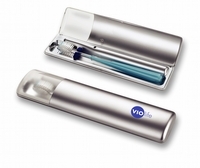 We are proud to carry the Violife brand of toothbrush sanitizers. They come in a variety of sizes to help keep you and your family healthy, whether you are at home or on-the-go.